04:35:00 Makes 6 servings, 1/2 cup (125 mL) each. 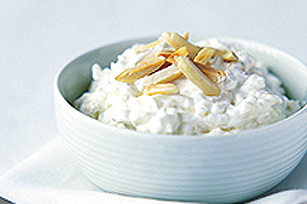 We've given rice pudding a fresh hit of flavour. Made with crushed pineapple, this Fruity Rice Pudding recipe is sure to become a weeknight favourite. Mix pineapple and water in medium microwaveable bowl. Microwave on HIGH 5 min. Add rice and sweetener; mx well. Cover. Let stand 30 min. Stir in whipped topping. Store in refrigerator. This easy-to-make rice pudding, with the added goodness of fruit, can be part of a healthy eating plan.